The 4-foot Caiman Lizard is primarily aquatic, as area few of the smaller teiids. It occupies rivers, small streams, and swamps, and swims quite well. This is a diurnal lizard which rests on land at night and spends the day in the water. While some of the other water teiids feed on small fishes, tadpoles, and frogs, the Caiman Lizard subsists exclusively on aquatic snails, some so large that they can just be grasped with the mouth wide open. Such snails are carefully maneuvered to the back of the mouth and crushed between the posterior teeth of each row. 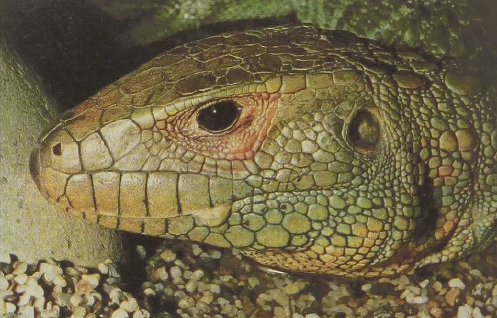 Unlike the front teeth — indeed all of the teeth of other teiids — the back teeth of Caiman Lizards have enormous rounded crowns, and the shells are crushed between these. The animal then carefully separates shell from soft parts with its tongue and wipes shell fragments out of the mouth before swallowing the snail.